Friday night I went to a drum circle. I learned about drum circles a few months ago. Never in a million years did I think that I would be comfortable sitting among a group of strangers while playing a drum or another type of percussion instrument, but I am. My chiropractor isn’t a doctor you go to see because your back hurts, she’s a person you see because you want to live a full life and understand what it means to accept who you are and how to tap into your potential. She understands a lot about how the mind, the body, and the universe are intertwined. I know the whole “universe” thing sounds hokey to some people and that’s ok, it’s not important that we all phrase things in the same way or believe in identical concepts. What I think is important is that we all understand that as people, if we band together in a whole-hearted and authentic way we can literally move mountains. The reason I bring my chiropractor up is that she’s the reason I attended a drum circle on a Friday the 13th when the moon was full and the night air was heavy and wet from the rain earlier in the day. Plus there’s the fact that she’s a master at going with the flow of life. The original plan for the full moon drum circle was to play our drums, shake tambourines, and laugh like children outside on the lawn. The weather forced us to plan B and we met on the second floor of her office building. It was immediately apparent that we were going to “plan C.” Two drums helped keep the beat, mine and one other. With my drum strapped over my shoulder I took my place at the end of our impromptu parade. The parking lot was wet, and my feet were bare. 15 or so grown-ups of varying ages, shapes, sizes, colors, and experiences danced and played instruments while splashing through small puddles on the pavement under a cloud-filled sky that covered, but couldn’t hide the power of a full moon. We ended the night with a meditative and peaceful walk along the beach. The walk took place behind closed eyes and through relaxed spirits. It didn’t matter that we were sitting in an office building nowhere near a beach; we allowed our minds to take us there. The event could have been cancelled because it couldn’t be carried out according to the original vision or it moved inside. We still had an amazing time. Moving an event from outside to inside is a very small but meaningful example of the power and value of being open to Plan B and sometimes maybe even plans C through Z. 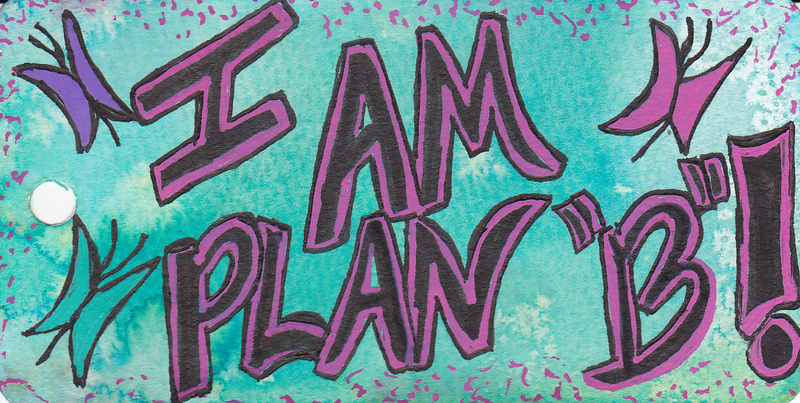 We think about plan B’s easily when it comes to things like making back-up plans in case it rains, we’re not always so good at coming up with alternatives when our original “life” plans go awry. I believe this is especially true during highly stressful and transitional times. It’s that whole, “can’t see the forest for the trees” thing. During these times is when it’s most important to listen to our inner voices and pay great attention to what’s happening around us. Plan B may be right in front of us and opening doors that we never imagined but might miss if we’re spending our time worrying about why our original idea didn’t work out. If you have the opportunity, I highly recommend it.